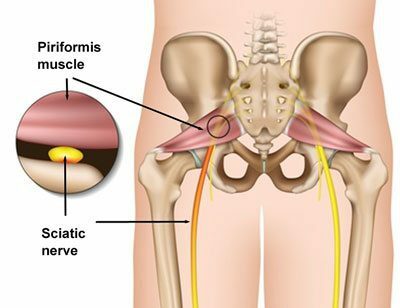 Sciatica vs Piriformis Syndrome: Sciatica is identified as a group of symptoms occurring when the sciatic nerve, found on the lumbar region of the spine, becomes irritated. The most commonly diagnosed cause of sciatic nerve irritation, or sciatica, results due to compression or impingement of a single or multiple nerve roots caused by natural spinal degeneration with age or a disc herniation in the lower back, which may occur after trauma from an injury. The symptoms of sciatica generally originate in the area of the buttock, and depending on the grade of the underlying nerve compression and inflammation, sciatic nerve irritation may radiate down the entire leg into the ankle and foot. Piriformis syndrome is a condition in which the piriformis muscle, found in the buttock region from the upper femur bone to the edge of the sacrum, or the pelvic bone below the lumbar spine, contracts and spasms causing pain and tightness as well as tingling and numbness. 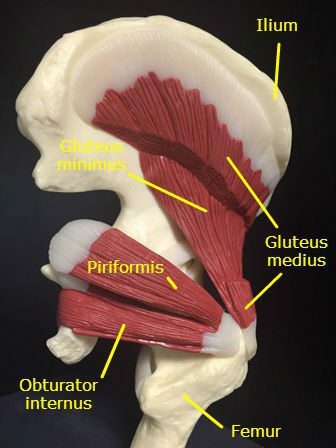 The symptoms of piriformis syndrome are very similar and are often closely associated with sciatica. In some cases, the condition actually causes sciatic nerve irritation. Because the sciatic nerve runs underneath or through the middle of the piriformis muscle, contraction or inflammation of the tissues in this area may compress the sciatic nerve and develop sciatica symptoms. This is one of the main reasons when sciatica vs piriformis syndrome gets misdiagnosed. Consequently, though, because the most effective treatment options for sciatica and piriformis syndrome vary considerably from each other, it is ultimately essential to receive a proper analysis in order to determine the correct diagnosis of your symptoms. In most cases, there is an easy way to distinguish when sciatica vs piriformis syndrome. When the problem is one condition versus the other and not both conditions at the same time, there are two simple methods that will help verify the presence of sciatica apart from piriformis syndrome. First, while in a seated position, if the individual straightens the affected leg so that the leg is parallel to the floor and the sciatica symptoms increase, this could suggest the presence of sciatica or true sciatic nerve irritation. Then, for the second method, from a sitting position as well, the individual should first bend the affected leg and pull their knee towards the same-side shoulder. In all but the most severe cases, there should not be a major increase in pain while in this position. Continuing with this same method, the individual should then pull their knee towards the opposite shoulder. An increase in sciatica-like symptoms is a strong indication of piriformis syndrome. If you’re experiencing any form of symptoms that may be causing you pain and discomfort, its crucial to seek immediate medical attention to determine the presence of any other underlying condition that may be causing the symptoms. A chiropractor focuses on diagnosing and treating a wide variety of musculoskeletal injuries or conditions, including sciatica. Through a series of spinal adjustments and manual manipulations, chiropractic care can gradually restore the individual’s natural health by relieving the stress and pressure being placed on the spine which could be causing the pain and discomfort.